As ID Quantique is now well installed in its Bristol office, it’s time to present one of the projects we are working on: Single Photon Range Imaging for Natural Gas Sensing aka SPRINGS. Awarded funding from Innovate UK as part of a competition aiming to enhance UK competitiveness, growth and improve national productivity, IDQ’s SPRINGS project has been recognised as a potential cutting-edge innovation that could lead to significant growth. IDQ will lead its partners QLM Technology, Sky-Futures and the University of Bristol in a project to explore how photon sources and detectors – an essential component of quantum communications systems – could be used to detect gas leaks with high levels of accuracy. Indeed, the Oil & Gas industry has a constant need to check its facilities for leakages in a regular and cost effective manner. Existing technologies lack a suitable operational distance and quantitative measurement capability. IDQ and its partners’ technology advantages will be its abilities to measure leakages from a safe distance and cover large areas quickly, with high accuracy and in a quantified manner. Gas sensing is a growing market, with Oil & Gas leak detection alone expected to grow to $3.4Bn in 2022. Natural gas leaks cost companies $30bn per year, the ability to detect these leaks is limited by the characteristics of existing technologies. The SPRINGS project sets out to develop a quantum-inspired laser radar (LIDAR) capable of detecting the lowest concentration of natural gas leaks required by the industry out to hundred metre operational distance. This brings a 10-fold sensitivity improvement over our closest competitor and enables fast scanning and imaging. 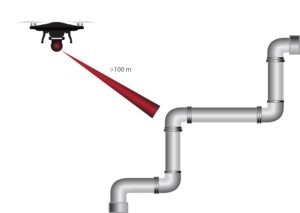 It is lightweight and low-power and unlocks new applications for Oil & Gas and waste management industries, and it delivers an unprecedented surveying speed. To ensure long-term leadership, IDQ and its partners will also develop a quantum-enhanced prototype, taking us to mid-IR wavelengths, for a further 10-fold performance gain. This opens up the possibility for other gas species and unlocks applications such as Oil & Gas exploration and remote detection of explosives. For more information, contact Catherine Simondi – Marketing Director at IDQ. Innovate UK is the UK’s innovation agency. Innovate UK works with people, companies and partner organisations to find and drive the science and technology innovations that will grow the UK economy. For further information, visit www.innovateuk.gov.uk. QLM Technology (Quantum Light Metrology) is an oil and gas instrumentation business. For further information, visit www.qlmtech.com. Bristol University is ranked among the top five UK institutions for research excellence. For more information, visit www.bris.ac.uk. Sky-Futures has established itself as the world’s leading provider of drone-based inspection services to the global industrial markets. For further information, visit www.sky-futures.com.